It started with a “chance” encounter and a book. At the 2014 PRMI Missions Conference, I met a missionary family from Bolivia. We got to know each other before I returned to Panama where we lived. Two weeks later, I returned to the Community of the Cross for some down time. Coincidentally, the missionary’s brother, Pastor Jose Luis, was in the area with his family, visiting from Bolivia. We tracked each other down. 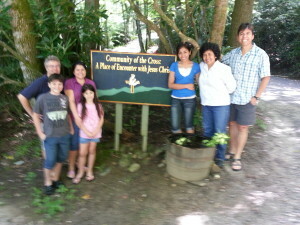 Our families met at the Community of the Cross.